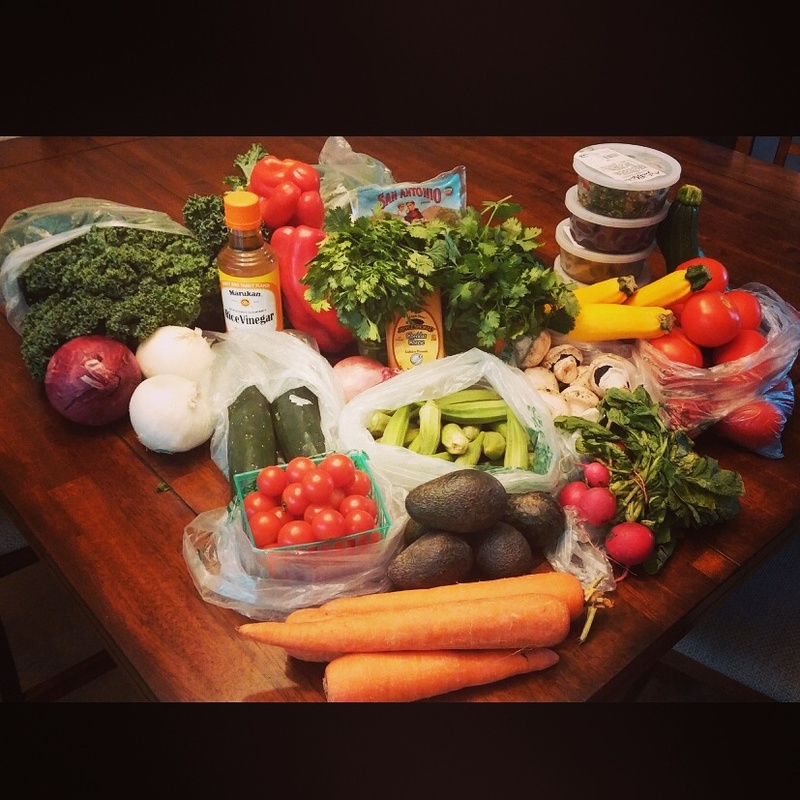 healthyeasyfoods | Making HEALTHY eating EASY and AFFORDABLE all while still being DELICIOUS! Making HEALTHY eating EASY and AFFORDABLE all while still being DELICIOUS! The last few months have been full of non-stop discovery. Each new day brings with it a gift. Last week the wild rose bushes bloomed everywhere and filled the air with a clean, sweet smell. We are making sugar scrub with the petals! Next the mini patches of strawberries poked their heads through and we were able to pick handfuls. Now it’s time for cherries. We’ve been driving past a nearby farm for weeks watching, wondering what type of fruit would soon dangle from the blooming trees. It wasn’t until a new friend extended an invitation for us to go cherry picking that we had our answer. Cherries. All kinds of cherries. Bing cherries. Queen Annes, Pie Cherries, Rainier cherries. Of course we were delighted to accept the invitation and spent a warm but breezy afternoon delicately plucking cherry after cherry into our mouths, every once in awhile managing a few into the bucket. 2 1/2 hours spent roaming the cherry fields, climbing trees, and filling our bellies with fruit from each tree we passed, only to ensure it wasn’t any better than the one before it of course. We managed to fill 2 buckets worth and that all together with one giant cherry stained smile from the little nugget made for a pretty perfect afternoon. The next three days hilarity ensued as the nugget tried to take full control of the cherries. Upon arriving home, she dragged the entire cooler straight into her room. The following afternoon, I began pitting the cherries to freeze and she wasn’t a happy camper. Every time I opened the cooler, she fiercely ran and closed the cooler lid, looking me square in the eyes “No more Mom!” Little arms reached in quickly to grab an extra large handful for herself and then plopped down to sit on top of the cooler, ensuring my denied entry to her special stash. Baths started to seem pointless because within 5 minutes of being clean we would turn around to see her covered yet again in cherry juice. Her arms had been designed in cherry henna and at one point my husband asked ” Is that a bruise or just cherry juice?” referring to a spot she somehow got on her back. It was cherry juice. We’ve already decided we need to go again and pick a few more bucketfuls before the season ends. Next time they might need to weigh the nugget before we begin! With some of our cherries we created a fun, sweet and cool treat! I hope you enjoy this recipe and find yourself some local fruit to pick this summer. Run strawberries through juicer on your ice cream setting or blend in blender until creamy. Fold in fresh chopped cherries. Spoon on and even out cherry ice cream on top of half a graham cracker. Place another graham cracker on top to create an ice cream sandwich. Once filled place on parchment paper and let freeze overnight. Melt chocolate until smooth. Dip half of each ice cream sandwich into the chocolate and put back into the freezer. Let chocolate harden about 20-30 minutes. Enjoy! Last but not least we snuck a handful of the last cherries into a soak in locally made Pendleton Whiskey for an adult treat during these hot summer days! I am a believer that we need to see a major change in our food production because our health is on a very serious downward trajectory based on the current system. It can sometimes feel like an uphill battle against all these giant conglomerations of companies, especially when you walk into a grocery store and see 90% of the store taken over with commercial, highly processed food options. Things we shouldn’t even call food. I’ve gotten flak before for buying organic and being a bit strict about what comes into our house food wise. It’s because when you really educate yourself about the food system, you will find disgust at what’s being allowed in for consumption and the facts are daunting. Connecting with powerhouse people who are advocates for our health, food safety and future farmers of America is what keeps me inspired that things can change. One of these powerhouse people I want to introduce you to, if you haven’t already discovered her is former financial and food industry analyst turned food advocate, Robyn O’Brien. She’s one invigorating and educated powerhouse. It’s a magical time of year that I haven’t been a part of in over a decade, thanks to the spoils of a tropical climate void of any seasonal change other than cloudy. The season of Spring. Ohhhhh how I’ve missed you. I’ve forgotten the trances you fall into while you stare at Mother Nature unfolding her creations. The soul spells cast deep into your being as you experience new life burgeoning every which way you turn. Scraggly, barren trees, looming and reminiscent of Tim Burtons Night Before Christmas scenery only a month ago, now spawning bold, bright green buds that have erupted into pure white, floating flowers. Tiny, blue eggs laying in their nest tucked up in the awning of the garage. Baby deer walking through the back yard. Bright purple lilacs and sunny, yellow tulips throwing their pops of color against the dark green backdrops of the fir trees. A warm sunshine with a cool breeze. Perfect weather for starting the garden. Waking every morning to see which little seedlings have unearthed their little heads. Having your first cup of coffee on the front porch in the morning and the last glass of wine on the back porch at night. Staring at the sunset through the huge blooms on the lotus tree, mind quiet and calm, the sweet sound of high chirps from the new baby birds just born. Spring. Ohhh how I’ve missed you. spending our mornings in the sunshine after baking. Budding race. Tomatoes or Peppers? Start the grill. Right now. Ok, ok I’m being demanding but these were too good and I’m excited to share. I had the luxury of roaming around my dearest friend, Jules, garden a few days ago and it was beautiful. We saw baby peppers, kale, basil, beans, squash blossoms and more. Gardens are a happy place for me if you can’t tell. I still think my favorite childhood book and movie is The Secret Garden. Anyways, I’m off topic. Go figure. But I must hurry because you’ve started the grill and your coals are hot. Slice Squash into rounds thick 1/2in slices. 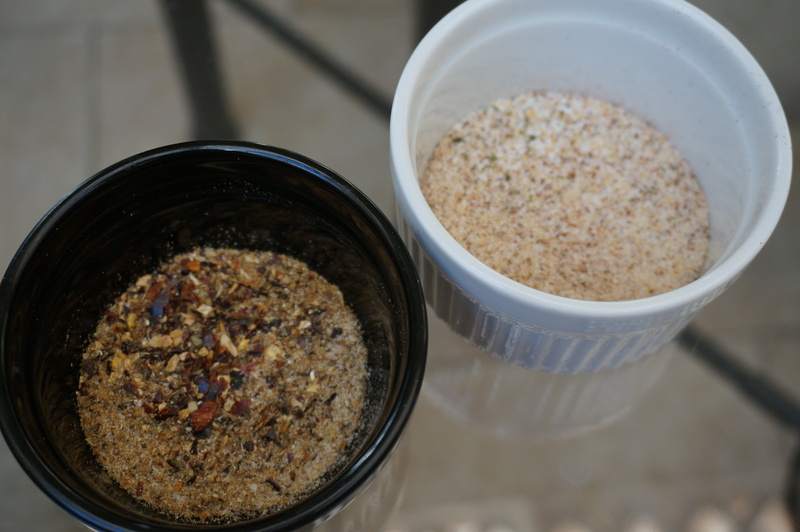 Mix 1/4 olive oil with 1/4 tsp of each garlic powder, onion powder, oregano, paprika, salt and pepper. Brush each side of each round with a little of this olive oil mixture. Set Aside until Grill is ready. 1/2 cup grilled corn cut off the cob or 1/2 cup canned corn. Mix all ingredients and let it sit until ready to use. Grill each round 2-3 minutes on each side until soft and slightly charred. Top with salsa and crumbled feta. Enjoy this healthy meal!! 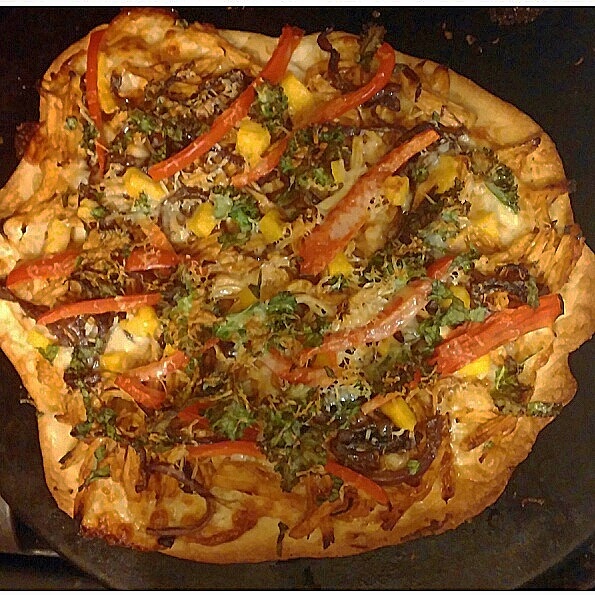 Memories of food create my world kaleidoscope. The other day while scrolling through Facebook I had the realization of how lucky I am to be able to stay connected to so many people from my childhood. Looking at each person, a second level of thought was occurring. I realized with each friend, I had an associated food memory. Memories started spilling out of my head. My friend Bev and I used to make this amazing pasta salad which we would eat sitting at Shafsbury lake in Vermont on hot summer days. I still love me a good pasta salad with Italian dressing. One of my last babysitters before I was finally considered old enough to stay home alone, Dee, introduced and taught me how to make grits. Salty, buttery grits. Best served with a runny fried egg on top. I celebrated moving into my first apartment with my friend Nia by trying avocado and caviar. The first dinner my husband cooked for me while we dated, was Chile relleno with fresh New Mexico hatch chile. That dish will always be remembered. Spiccccy. When I eat, that first experience is still woven into my perception of those foods. When I create food for other people I want them to have that same enjoyable experience that creates a memory. One of the more saturated situations that takes away from the importance of food memory is that we are forgetting to feed our soul with the food we are eating. As a country over 200 billion dollars is spent annually on fast food. That’s absurd to me. We can drive though fast food chains thinking that it saves money, time, and dishes but are we really saving anything? I think we are losing touch. We lose that family time spent in the kitchen, appreciating ingredients, a connection with your food source. Truly gaining an understanding for life. All of these memories changed my relationship with food. Everyone I’ve met has given me a piece of them through cooking, which is maybe why George Bernard Shaw said “There is no sincerer love than the love of food”. I want to encourage everyone in todays busy world to sit down at the table together, disconnect from technology and connect with each other. Let the bonding begin even by encouraging your children to cook with you. Look around, research your local wild foods and instead of investing in large fast food chains, invest in yourself. Learn a new recipe, try a new veggie, bust most of all make memories. My emotions got the best of me today. I got angry. Soon followed by frustration. Aggressive waves of disbelief and disgust continued to slap in my mind all day. The reason behind my anger isn’t something new. The anger itself, yes, but not the reason. Words and Phrases like NO High Fructose Corn Syrup, Antibiotic free, hormone free, free range, rBST free slapped my train of thought all day. Funny how the word “free” normally has such positive connotations, but next to those ugly words, its positivity falls short. Why do we have to worry if our meat is hormone free? Or if milk came from cows not treated with rBST? rBST? No that’s not a typo. I just had to say it again. Who the hell besides the person who syntesized it, the farmers who use it, and the milk now labeling it, knows WHAT THE HELL rBST is?? Well I do, since I had to educate myself on what possibly could be happening to my milk and creeping into my consumption. Actually on an incredibly sad level, more people these days probably know what rBST stands for and represents. It’s been banned in European countries, declared unsafe, linked to several health upsets and yet still, IT’S FRIGGEN LEGAL in the US. What more do we need before this product is intolerable? Why is this even close to acceptable? RBST is just one of the many, many, many problems we are facing in the food industry. Our food has become industrialized. Once upon a time it was categorized as the hunters and gatherers growing into the butcher, the baker, the farmer. Now it’s an industry. Names like Monsanto come to mind when we question where our food originated. Labels everywhere boast Hormone Free, Non-GMO, no artificial colorings, pesticide free, Bpa Free, etc. You get the point. It’s sickening. The pleasure in seeking out my food feels tainted. The thought of added Hormones in food is a turn off. A giant, smelly, piece of fish gone bad kind of turn off. Should’nt the idea to create such artificial means of food creation stopped at a thought? Has food science gone too far? Work through me with this. I have a lot of questions. It just doesn’t make sense. Food is life. Why have all these awful chemicals become such an integral part of our food systems? When you think about good food, your senses want to be on the happiest merry go round of their life. You want to see a beautifully red tomato, smell ripeness, feel tenderness, taste it’s sweetness. Instead we are losing that culture because we are being re-set to distinguish our food by labels. Do we even trust the labels when we are splurging for the organic? How did we get to this point? What have we lost in the process? Hands down one of the easiest, tastiest appetizers you can put out for guest in a zip! Always a good conversation starter too, because guest are sure to inquire more about these tasty looking peppers when they see them sitting, glistening with lime juice. “Are they hot?” is sure to be asked. Typically no. However, see the above title of the blog. Pepper Roulette. They earned this name after serving these to my mother in law, who we assured over and over again, they are NOT spicy. The first one she bit into set her mouth on fire. I was watching her face turn red and eyes water and I still didn’t believe her. I’ve made them a bunch of times and NEVER had gotten a spicy one before. I had to actually finish the one she bit into and then I fully felt her pain. Now that you’ve been warned, don’t be a weenie and go try them. I promise, the majority of the time you will get a delicious, chared, sweet pepper. If by chance you do get the spicy one just remember you can’t fully appreciate all the good without a little bad ;-). Heat up your cast iron pan until a drop of water sizzles off of it. Add oil and wait 30 seconds. Add Shishito Peppers and let cook for 3 minutes stirring occasional and letting them get a nice char/blister. Squeeze one half of the lime over the peppers while they are cooking and char for another 2 minutes. Remove from pan onto a plate and squeeze the other half of the lime all over them and salt. Serve up and play a little pepper roulette! It’s been raining non-stop here in our normally sunny San Diego, which means I have absolutely no desire to drag my 15 month old and myself out, especially to the grocery store which requires lugging it all back inside through several trips. With that being said, I stared longingly into my fridge and cupboards yesterday wondering what I could whip up for dinner with what little I had on hand. The result: An amazing pinto bean soup. It was a hit with all three of us. My husband the meat eater, myself the vegetarian and my picky child. Begin by slightly sautéing carrots and onions in saucepan, after two minutes add all seasonings and sauté for an additional 2-3 minutes. Now go ahead and add your water, pinto beans, and vegetable paste and stir. 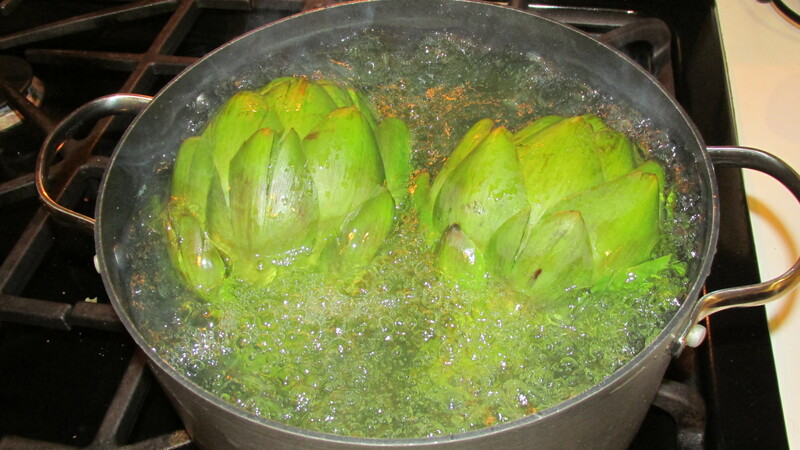 Bring to a simmer and cover for 1 1/2 hours. Open and add your cabbage and cook for an additional half hour. Scoop 3 cups of entire mixture into a deep measuring cup and use your immersion blender to thicken. Once blended add back into your soup and add frozen spinach and the squeeze of half a lime. Cook for another 10-20 minutes season with salt and pepper and serve topped with chopped cilantro. 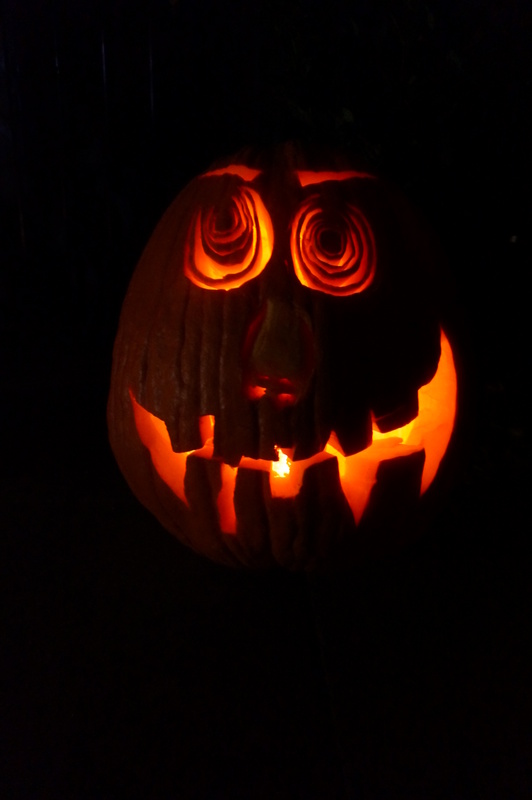 Needless to say it’s become a ritual and it seems each year the pumpkin gets a little bit bigger. We have a blast carving them and instead of munching on candy the whole time, we can pop some of these healthy treats into our mouth. 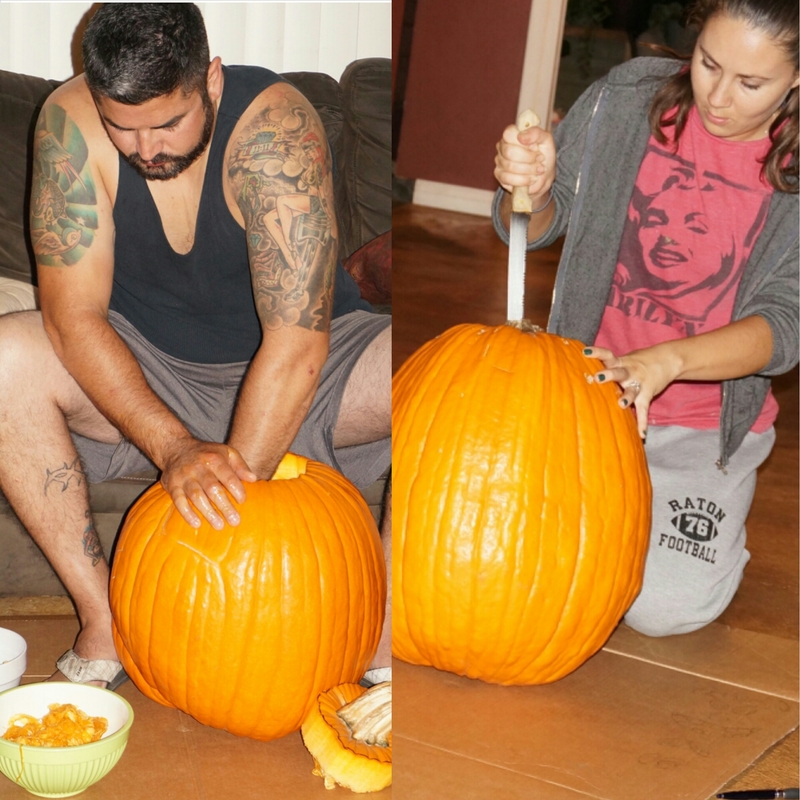 So Last night we carved our pumpkins and this morning my house smells absolutely friggen amazing. 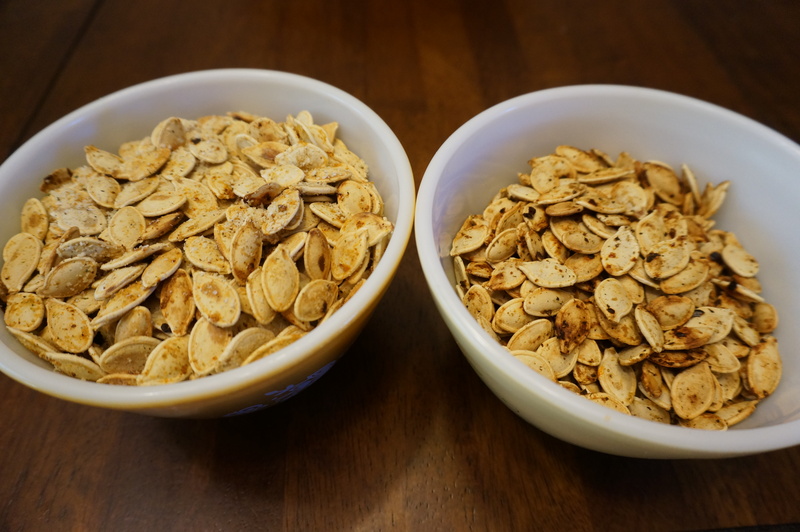 In my oven, two kinds of freshly seasoned pumpkin seeds are roasting themselves to perfection. Candle this smell up please. This recipe is super easy, healthy and delicious!! 1. Simply rinse your seeds, and boil them for 10 minutes in a cup of water and a teaspoon salt per cup of seeds. 2. Mix your seasonings. In the white dish I have mixed a teaspoon of each garlic powder, onion powder, and parmesan cheese. In the black dish I have mixed smoked chili powder, lemon pepper, salt, and cumin. 3. 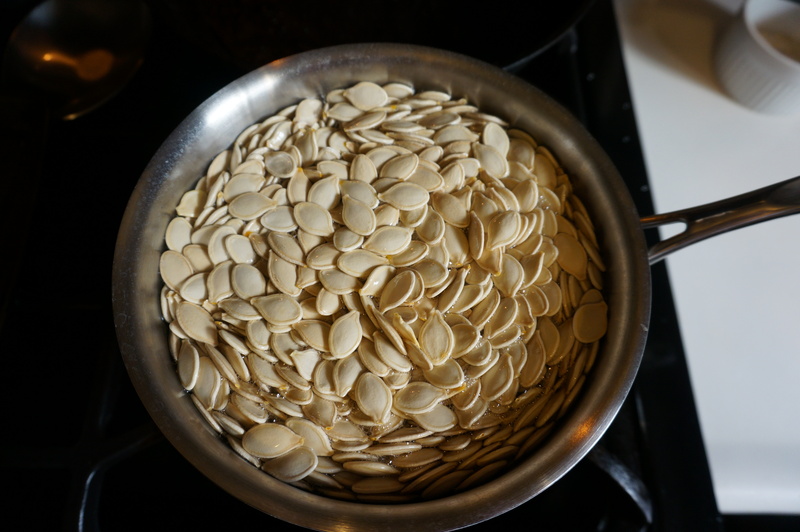 Once your seeds are done boiling for 10 minutes, drain them and toss with 2 tablespoons olive oil and then lay them out flat on a cookie sheet. 4. Roast your seeds at 400 degrees until they begin to turn a golden brown about 30 minutes. Boom! 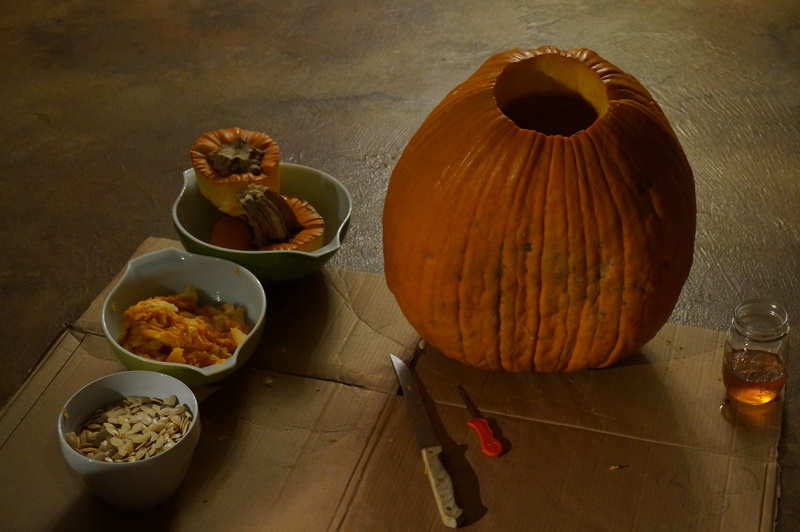 You’ve just made your own pumpkin seeds. These last for weeks and go great on salads, in handfuls as snacks, or on top of soups. I have about 45 minutes to post this blog under this title before it doesn’t make sense. “Think about it Thursday.” I’ve been thinking about it all day and now I just need to spit it all out. A painter uses many different types of brushes and paints to create a variety of textures and looks. I am noooo painter. Trust me, my husband will gladly attest I shouldn’t be allowed to paint even a flat, giant, single wall because somehow, I will end up with paint on the two adjoining walls, ceiling, floor AND I will have partially painted myself. What can I say? I go color happy. No no a painter I am not. Sorry to disappoint you Sam I am. Mmm but I do like green eggs and Ham with tarragon, allspice and a little jam. Whoa ok enough with the Dr. Seuss. 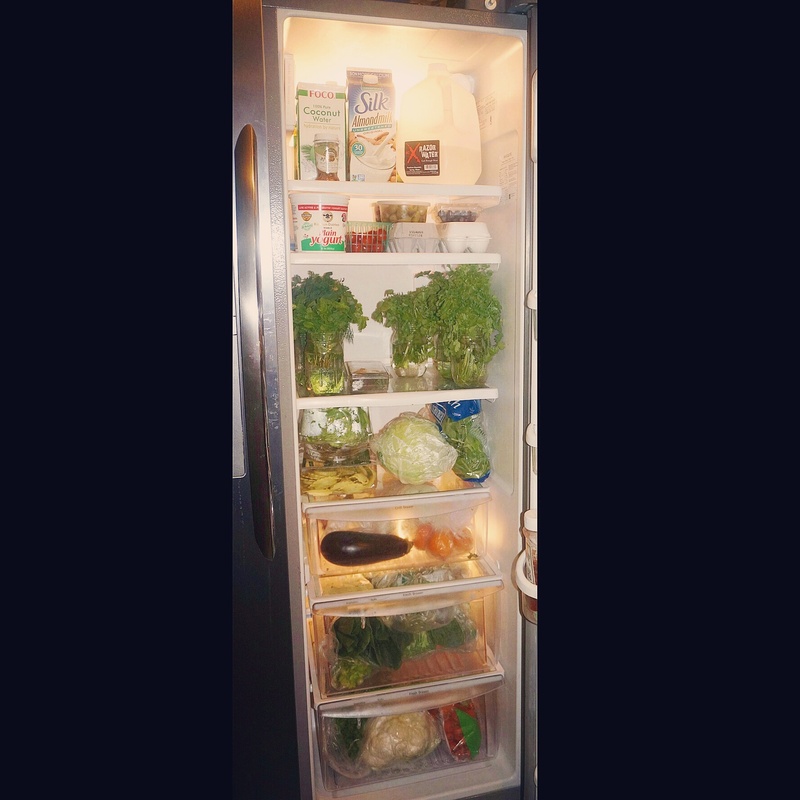 Let me get to the point (finally I know) …The Importance of Stocking a Kitchen for Healthy Eating. Spices, Herbs, Oils and Vinegars. I swear I wasn’t trying to go all Dr. Seuss on that one again, it just happens to rhyme, but these four things can add an infusion of flavor on so many different levels when you learn to play with them. Olive Oil, which is common, truffle oil, red wine vinegar, balsamic vinegar, peanut oil, sesame oil (one of my favorites) fish sauce, anchovy oil, ….oh the list goes on and on. Don’t get me started on spices and herbs. Ok, ok just a few. Cumin, lemon pepper, basil, oregano, saffron, fennel, cilantro, mint, nutmeg, thyme, dried mustard, crushed red pepper, rosemary, Garlic Ohhhhh Garlic. 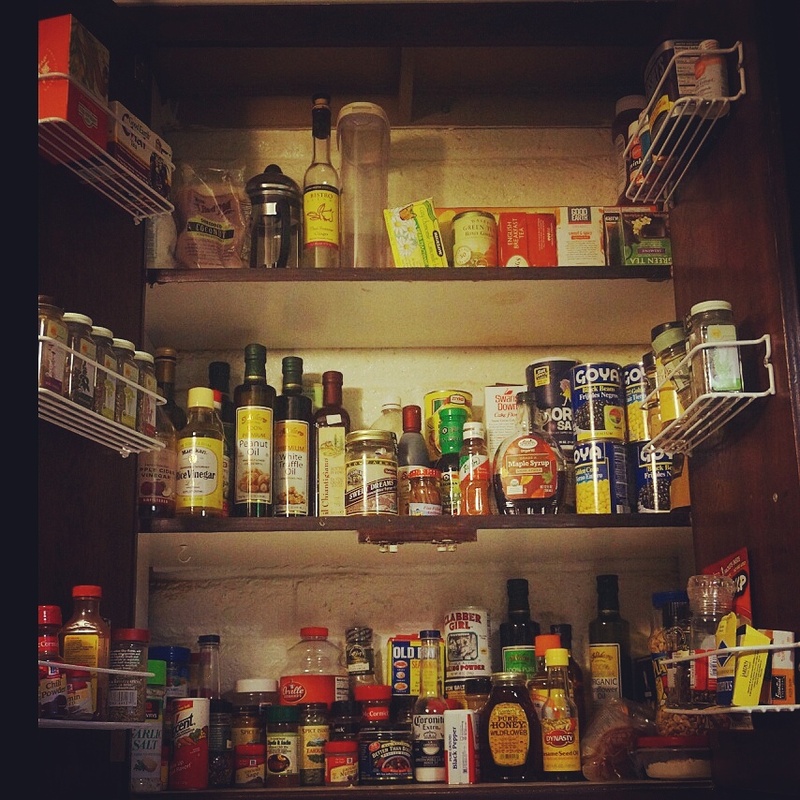 Make a mental note of what resides in your cupboards and cabinets. Make a commitment to less pre-packaged, quick substitute foods. I have rare exceptions but usually my rule of thumb is usually if it comes in a box, or plastic packages I don’t purchase it. 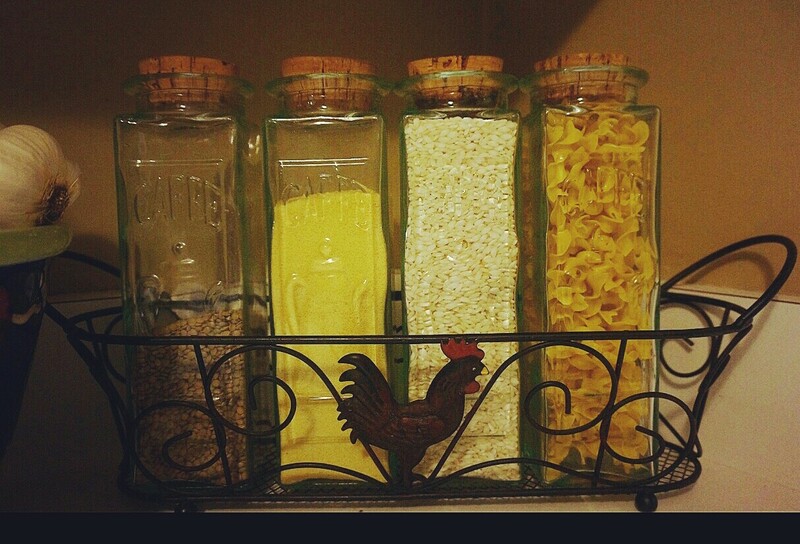 I constantly keep our starches stocked with lentils, white rice, wild rice, arborio rice, pasta, potatoes, quinoa and cous cous. These can help pull any meal together. Next keep the veggies drawers always stocked with the standard, celery, carrot, lettuce, spinach, cucumbers, and whatever else may be in season. Add a little dash of this, a little dash of that, go explore! Find your inner Christopher Columbus or Picasso. Paint away with your ingredients. MMMmmmmm Pizza. Who doesn’t like pizza? Born in New York, I am especially partial to thin crust pizzas and this dough recipe has become one of the staples in our home. 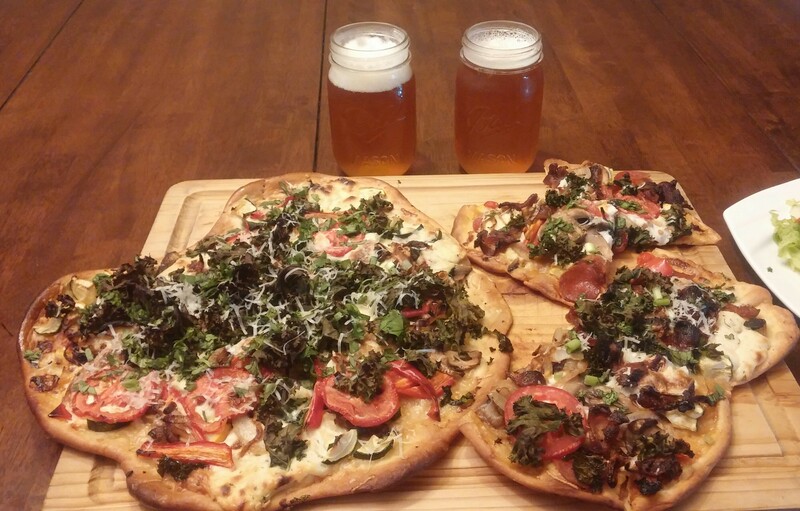 The flatbread becomes a vessel for your foodie creation allowing you a meal that can be so versatile in flavors. A perfect way to use all those leftover veggies at the end of the week, let the kids jump in and each make their own and watch the joy it creates. Heads up the dough is very easy to make however, it takes 3 hours to rise. I’ve put this dough through rigorous testing to see how easily I could mess it up and I couldn’t. It has come out delicious every single time. 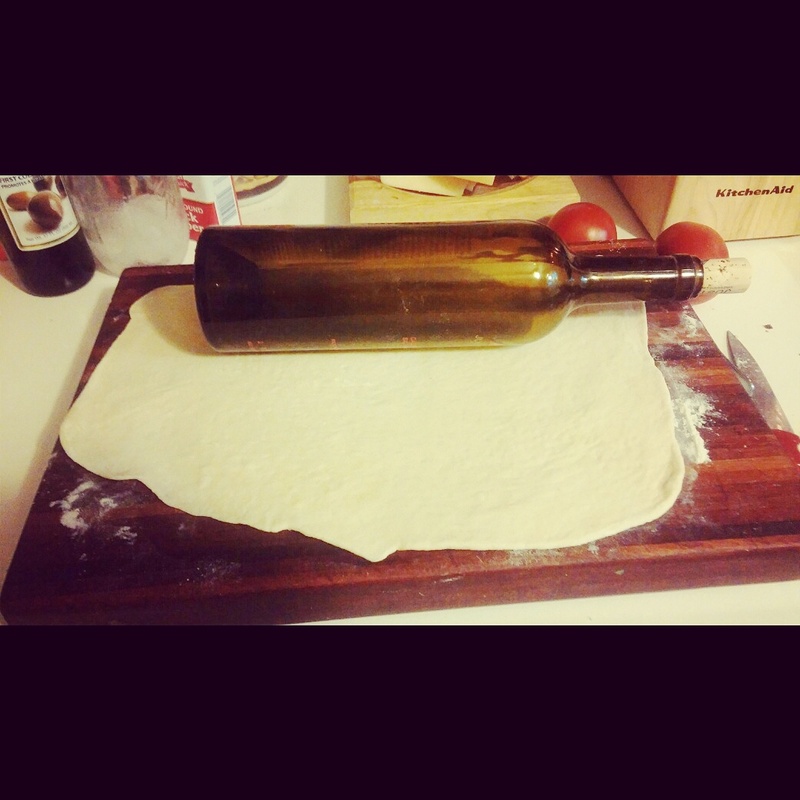 I didn’t have a true pizza stone so I cooked it on the back of a cookie sheet, no rolling pin so I’ve used wine bottles. One time, I made the dough and forgot about it until the next day. It still worked like a charm. Don’t be nervous that you’ve got to run right back home to this dough once the 3 hours are up. – Mix your warm water, yeast and sugar in a big mixing bowl. Let sit for a 3-4 minutes until dissolved. I put the ingredients in our kitchen aid with the dough hook and then add the oil, flour and salt. If you don’t have a kitchen aid, add all ingredients and kneed until you have a smooth round ball of dough about 6 or 7 minutes. I sometimes find that I need to add a little more warm water if the dough is too flaky as I am kneading it. (a teaspoon or two here or there). Once you have your ball of dough, cover it with a damp dish towel and leave to rise for 3 hours. This will make enough dough for 2 large flatbreads. I would say enough to happily feed 4 people. In another small dish combine 4 tablespoons of olive oil, 3 cloves of minced garlic, 1/2 teaspoon of crushed red pepper, 1/2 teaspoon of each dried rosemary, and oregano. This will be used later to brush the crust and infuse more flavor. About an hour before you are prepared to cook your flatbread, turn your oven on to 500 and put in your baking stone or cookie sheet. Letting the stone and oven get very hot will ensure a crispy crust. 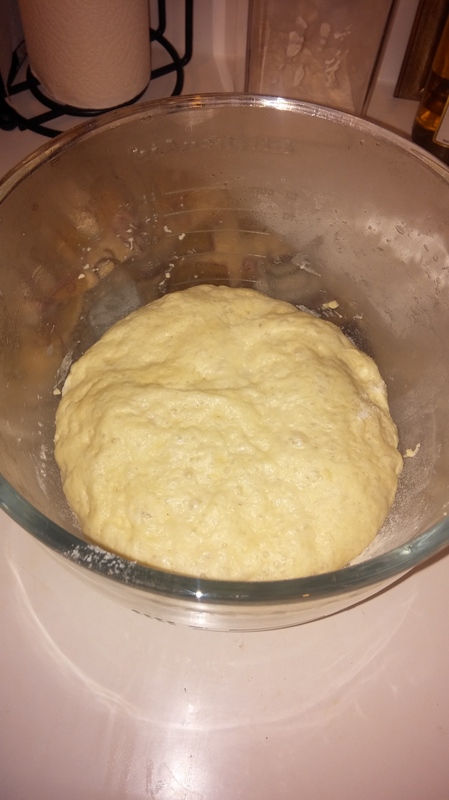 Once dough is ready I divide my ball into two and flour my rolling surface. Remember it’s a thin crust, about 1/4 of an inch thick. 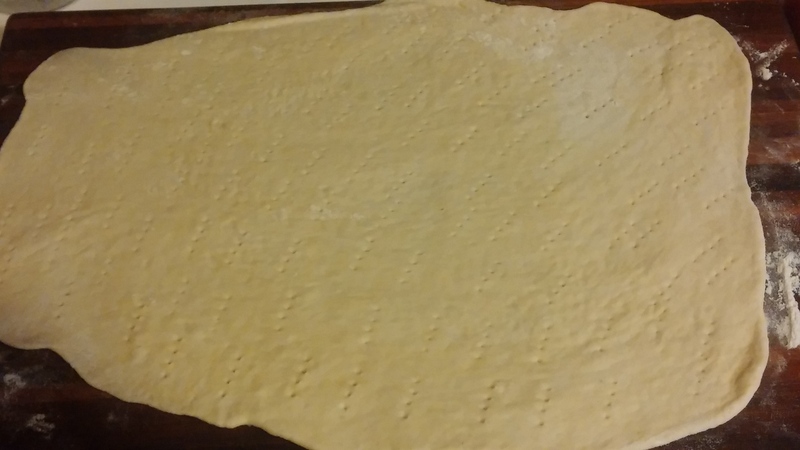 Once dough is rolled thin, take a fork and stab the dough all over. This will help keep the crust thin and avoid bubbling. Now you are ready to decorate!! I’ve found for best results it is most effective to pull out your baking stone and quickly transfer dough onto the stone. Brush dough with the olive oil mixture from earlier, making sure to get lots of that garlic everywhere. 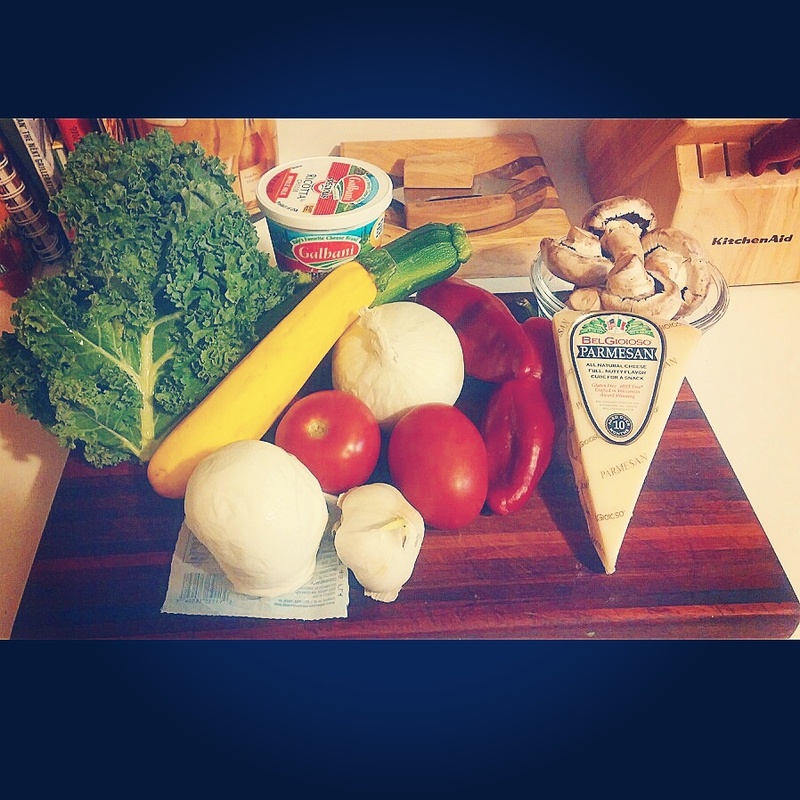 Top with whatever cheese and veggies you have on hand! You must work quickly to avoid having the stone loose it’s heat. Turn your oven down to 475 and put your flatbread back in the oven to cook for about 15 minutes or until crust is golden brown. Remove from pizza stone and put on a rack to cool for about 10 minutes before cutting pizza. Brush crush with olive oil mixture again. Do not leave on pizza stone to cool. A thin spread of tomato sauce, topped with fresh mozzarella, garlic infused ricotta, and chopped basil. Smoked gouda with yellow and green zucchini, red peppers, caramelized onions, topped with kale, shaved parmesan, and thin sliced tomatoes. Black Olives, spinach, feta, fresh mozzarella and red peppers. Now it’s your turn to crank up the flavor profile and show us what you’ve got! I can’t wait to see some of your flatbread creations. Money is Tight. Save a life. I changed my views on eating meat 4 years ago. Instantly, I hear a big majority of you booing and shouting a chant of BACON!!! BACON!! in hopes that it will bring me back to the meat eater side. It won’t. My husband is still a ravenous carnivore and I’ll gladly cook his bacon without so much as a second thought to shoving a piece in my mouth. It just doesn’t appeal to me anymore. I grew up on a farm with pigs, chickens, turkey’s, and every once in awhile a cow. Add the seasonal deer my family would shoot and that was our complete meat collection to get us through the year. I’ve watched as every one of these animals have been slaughtered and packaged for our freezer and I didn’t blink an eye until it was time to see the pig get butchered. Maybe you’ve heard at some point that pigs are smart animals, which is why it was the hardest to watch. They can sense something is coming, you can see their fear. 10 years old and there I was, distracting a group of pigs while I watched my uncle get behind Porky and quickly slice his throat from one side all the way to the other, ending his desperate squeals. Porky was then hung upside down from a huge backhoe and skinned. There he hung, his skin creating a mirror image of his body, it looked like two pigs were grasping each others hooves, holding on for dear life so they wouldn’t fall from the backhoe. I watched all this happen and STILL ate meat. Fast forward 12 years and now I am living in one of the best cities in the US, San Diego and no longer eating farm raised meat or vegetables. I began developing ovarian cyst and my hormone levels become a huge reason for concern. It didn’t take long to put two and two together that the only major change I had made was the quality and source of my food. I began learning what goes into a mass produced animal even before it is slaughtered and it is ghastly. 70% of all antibiotics in the United States are used on Livestock. (www.ucsusa.org) Now imagine what goes into your meat afterwards to increase coloring and longevity on the shelf? Something internal clicked and cemented that eating meat just wasn’t worth sacrificing my health anymore to indulge and continue to be ignorant to these blatant facts that bacon was no longer just bacon. So here I am, 4 years into being a vegetarian and I haven’t had a single cyst or problem with my hormones since. cOINKcidence? I think not. An added bonus to not having to visit the doctor every few months was that I began saving a ton of money. No more $8 for a lb of bacon or $12 for two pork chops, $22 for a pork loin. Beef and chicken are not cheap either. I would cringe as I looked at the meat prices. A weeks worth of meat was costing over $100 and that was just for the 2 of us! 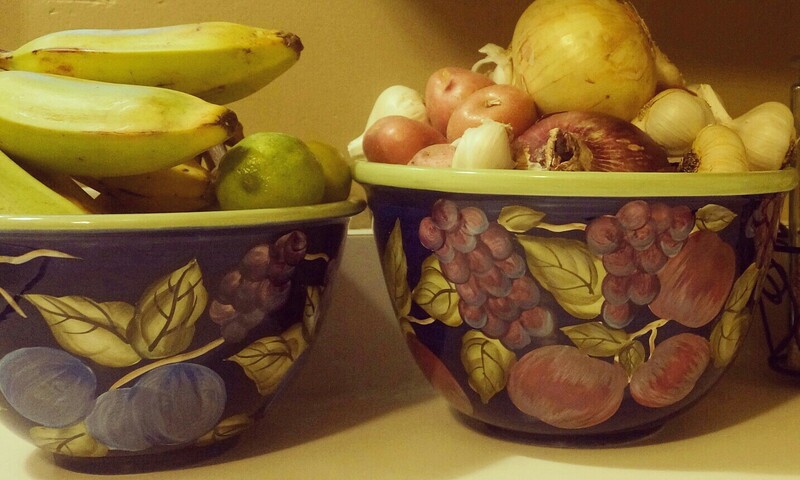 This week, I walked happily out of the grocery store carrying my 7 bags stuffed to the rim with fresh vegetables. Oh the glory i felt for having only spent $42.35 on an entire weeks worth of healthy, fresh food. I couldn’t wait to use it for so many different creations. Oh yea and I saved a life or maybe two. We’ll call them Miss Piggy and Wilbur. Th Th Th That’s all folks. This is simple, easy and delicious. The three major criteria for Healthy Easy Foods. I hope everyone who is looking to add a new vegetable to their repertoire finds this as yummy and easy as we do! Simply chop about a half inch off both the bottom and the top and add to a pot of boiling water. Boil for about 40 minutes. Test for doneness by pulling out a leaf. If it comes off easily and the “meat” is soft to the taste you are good to go! 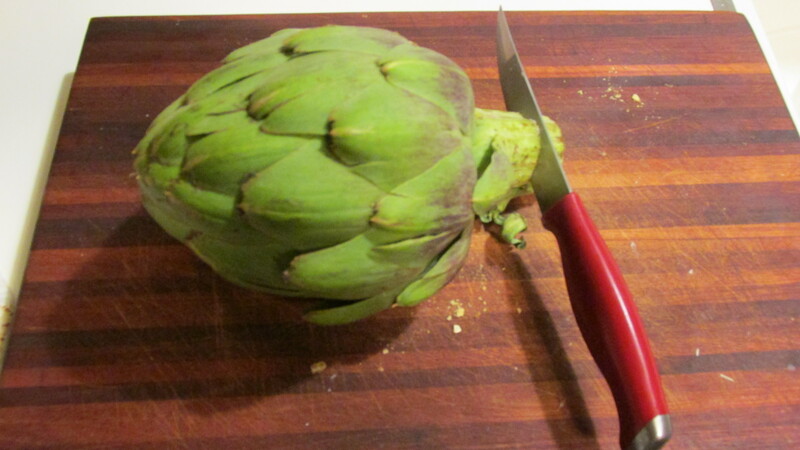 If you’ve never eaten an artichoke like this before you should know that you don’t actually bite the whole leaf. You use your teeth and kind of bit and scrape the “meat” off the end of the leaf without biting all the way through. When you get through all the leaves the best part is the heart. 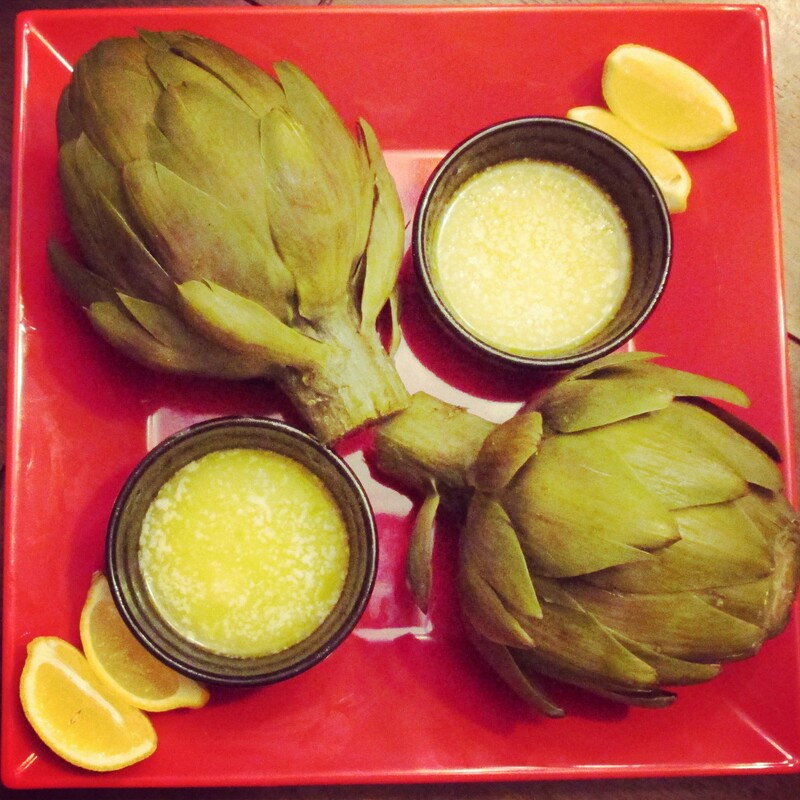 I usually make an artichoke per person because no one wants to share their artichoke heart. Serve these with a side of lemon to be super healthy or to be a little bad they are also delicious dipped in melted butter with a little garlic salt added to it. You can also create a quick lemon aioli as well for dipping. Oooo the dipping possibilities. Subscribe and follow my updates!